Hair is one of the few things that both men and women are often equally vain about. While some may go to greater lengths than others for maintenance, we all want to frame our faces with a good head of hair. It's important to carefully consider not just the brand of hair products you're using, but also the ingredients. Too many popular commercial brands are guilty of using ingredients that, initially, give your hair a wow factor, but will eventually strip your hair of moisture, breakdown hair proteins and lead to severe damage. The worst culprits can even cause health problems. Stay away from sodium laurel / laureth sulfate (SLS), also known as sodium lauryl sulfate, sodium laureth sulfate, ammonium laurel sulfate, sodium dodecylsulfate, sulfuric acid, sodium salt sulfuric acid, A12-00356, Akyposal SDS, Aquarex ME, and Aquarex methyl. While SLS is a key ingredient in industrial detergents and cleansing agents -- including engine degreasers and garage floor cleaners -- it is also shockingly found in a high number of leading shampoos. There's a laundry list of healthcare issues associated with exposure to this deadly chemical, least of which is the severe damage it does to hair by drying it out. In short, if it can degrease an engine, it shouldn't go anywhere near your lovely locks. Avoid isopropyl alcohol at all cost. Used in antifreeze, wood finish and shellac, isopropyl alcohol is designed to dissolve oils, which can strip the hair of moisture. 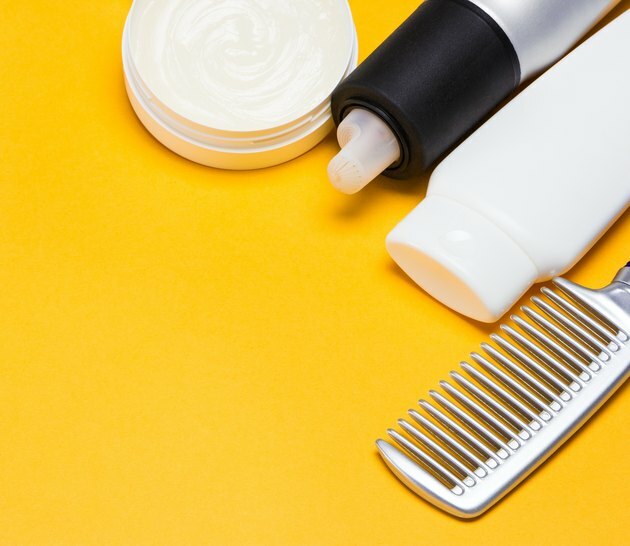 Many hair gels, root lifters, volumizers and hairsprays use this substance to help you hold a hairstyle's look -- at the risk of having your tresses snap off. In addition to this chemical damaging your hair one strand at a time, A Consumer’s Dictionary of Cosmetic Ingredients warns that inhalation or ingestion of vapor from isopropyl alcohol may cause headaches, flushing, dizziness, mental depression, nausea, vomiting, narcosis and even coma. Your perfectly coifed do will do you no good in the hospital. Proplyene glycol (PG) is perhaps to blame for scalp irritation. The United States Environmental Protection Agency lists proplyene glycol as one of the top 10 ingredients used in hair-care products that can potentially impact health with overexposure. Found in conditioners, shampoos, hair dyes, and styling gels and lotions, this offender breaks down healthy hair proteins and cellular structure while giving the appearance of shiny, smooth hair. In the world of hair care, proplyene glycol would be the proverbial "wolf in sheep's clothing." Another glycol to stay away from is PEG or Polyethylene Glycol. It's perfectly safe for its intended use -- deep cleaning ovens that have accumulated a ton of baked in grease. But unless you're regularly deep frying your hair in oil, you're not likely to ever need such a harsh chemical to dissolve oil and grease buildup on your hair. Keep this chemical in your kitchen, where it will do the greatest -- and most appropriate -- good. Go for natural: seeds and oils from avocados, shea, argan, olives and jojoba will give you shine without an oily buildup. Vitamin B in its hair-care form is known as panthenol -- your hair will stay safe as panthenol thickens follicles and retains moisture. Citric acid is also another safe bet, as it's used to lower pH balance in shampoos while keeping your hair cuticles flat. Just a little bit of careful consideration when picking out your products can save both your hair and your health from some of the nastiest effects of the chemicals found in many commercial hair care products. A Consumer's Dictionary of Cosmetic Ingredients, 7th Edition: Complete Information About the Harmful and Desirable Ingredients Found in Cosmetics and Cosmeceutical; Ruth Winter, M. S.
Does Sodium Laureth Sulfate Cause Cancer? Can You Make Broken Off Hair Grow Faster?